← It Is Only Money…are you ready for 2017? I asked C. Osvaldo Gomez if I could share his post with you. This is the gift of perspective. Enjoy. I did. I have two children, Rehani (5) and Ajani (3.5). 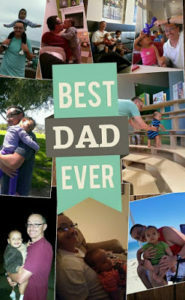 As someone who didn’t have the best childhood experiences with his father, I can tell you that being the best father I can be with my children is a top priority. But like all adults with kids, I often struggle. The biggest challenge I have with my children is being patient with them and giving them more of my time. Does this sound familiar? I used to believe that being a great father consisted of me providing. If my kids have clothes, a roof over their head, care, and security, then I’m doing my job. But this just puts me one level above a deadbeat dad. Loving your children makes you a great parent, especially if your kids are constantly reminded of your love with your affection, concern, and understanding. My kids are growing so fast. If you have adult children, you probably wish right now you could’ve spent more “quality” time with them before they got so big. Your concerns, however, may have focused on making sure you saved enough money for your children to go to college, as you yourself, saved for retirement. I don’t know if saving for my kids’ college education is going to make me a better father. I’m pretty sure my kids will appreciate having a college fund to tap into. At the same time, I don’t want to sacrifice the time I have to spend with my children by working more to save for their college fund. What’s the fondest memory you have of your father or mother? Were the two of you alone, on a trip perhaps? In my case, I remember going fishing with my dad. He usually went with some of his buddies, and drank beer while waiting for the fish to bite, but at least we were together. Well the “Cats in the Cradle” my friend! You need to consider saving money for epic trips with your sons or daughters. Yes, there are inexpensive things you can do with your children, but how about a camping trip? Or how about you fly to San Francisco or a great tourist destination with them? Remember these are one to one adventures. Don’t take all your kids at the same time or the moments won’t be as special. There’s a lot of pressure to be good with our money. I’ve allowed myself to fall for the trap that saving for retirement is paramount to any other type of saving. Obviously saving for retirement is important. But try to squeeze in saving for making great memories with your children if you can. Before it’s too late. Balance your roles my friends. You’ll lead a happier life if you do. Thanks for reading! Until next time. If you liked this post, and want to automate receiving more like them, please subscribe below. No spam, just me providing sound advice on various topics. This entry was posted in Family Sustainability and tagged build, family, Hope, leadership, money, perspective. Bookmark the permalink.